This is felt as a jabbing, burning, boring pain. It mostly occurs in the temple, or around the ear when you are chewing. Symptoms include weight loss and problems with eyesight. Temporal headaches usually occur in people over 55 years of age. 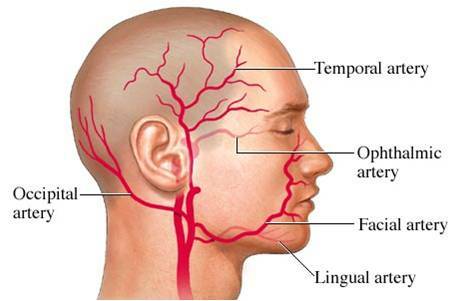 They are caused by an inflammation of the temporal artery. If you believe you suffer from temporal headaches, first consult your physician to see if steroid therapy is needed. Vitamin C complex is essential in healing inflammation, 3,000 to 6,000 mg. daily, in individual doses, will reduce swelling and the inflamed area. Zinc, 50 mg. daily, reduces inflammation and helps tissues to heal. Very important in reducing inflammation is to take one 125-mcg tablet of superoxide dismutase (SOD), an enzyme that acts as a powerful antioxidant; it assists in reducing inflammation. Another way to treat your temporal headache is to consult with a naturopathic doctor and find which cell or tissue salt you are lacking in. Have them test for any imbalance and administer the biochemical treatment of Phosphate of Iron.